Before giving updates on the Locke St defendants, it’s worth taking a moment to put things in their context and to remember that these seven people are accused of participating in a struggle against gentrification in the city. This struggle has taken countless different forms over the years, from mass meetings, to stickers and posters, to broad-based organizing, to counter-demonstrations and pressure campaigns. The reason so many people have chosen to dedicate their energy to this issue for so long is that it’s one of vital importance — people are losing their homes at an ever–increasing rate as housing is treated more as a commodity or investment than as a basic need that everyone deserves to have met. The broad, vague charges brought against these defendants are a way of silencing the increasingly urgent voices speaking and acting out against this attack on our ability to live in this city with dignity. The message of the police and legal system here is that there is no circumstance in which our deteriorating living conditions would ever justify any threat to property. And yet for over a decade developers, speculators, and their boosters have been easily able to ignore all opposition behind a wall of feel-good platitudes about renewal and culture. To now approach the struggle against gentrification as simply a matter of crime is an attempt to strip it of its content, concealing the larger struggle between the class that profits from rising housing prices and those who are displaced. When dealing with the hugely disproportionate violence of the state, it can be easy for us to lose track of these larger issues. Yes, we’re opposed to all forms of political repression, and we also don’t see that repression as separate from all the ways the police and government protect those who benefit from gentrification (business owners, landlords, investors) at the expense of those who don’t. Yes, we will support these defendants in beating their charges and getting through the incarceration and bail conditions they will have to endure in the meantime, but we will also keep finding ways to act against the dominant interests in this city. We can’t let ourselves be so swallowed by the support work that we give the rich a break. In terms of support though, the three people who were wanted by police turned themselves in last night (Sunday, June 3), and were released on bail today. The person who fought her conditions and stayed in over the weekend has also been released without the particular conditions she had refused. The person from Montreal will be up for his hearing tomorrow morning, and we are hopeful he will be released on consent and allowed to return to Montreal. More updates on his situation tomorrow. So far, all the recent arrestees are able to remain in their homes without having to deal with house arrest. 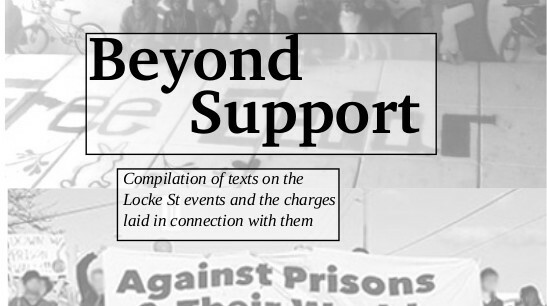 Although personal and financial support for the defendants remains important (https://fundraising.the-tower.ca for the Hamilton Community Defence Fund), a case of this importance requires solidarity that goes further than that. In the next week or so, we would like to encourage you to bring people together in your town to talk about issues of repression and gentrification, to talk about the details of this case and how it’s relevant to you elsewhere in the territory controlled by the Canadian state, and to clarify your basis of support for those accused. This might be a useful step in preparing to act in solidarity over the long term as this case drags on. Regardless of innocence or guilt, solidarity with the Locke St defendants and let’s keep pushing back against the power of capitalists. Even though I’m sure dealing with the charges is stressful af, it’s good to take the opportunity to put out a solid analysis of repression and anti-gentrification struggle like this. Definitely printing a few to share around.